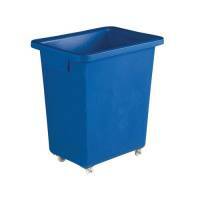 Can Tray Blue 4x25 Litre 312730 Pack of 1 For 25 litre drum storage. Rotational moulded with plastic deck. L920x W720xD175. Can capacity 4x25 litre. 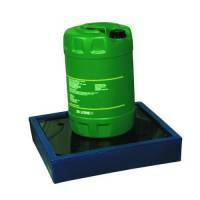 Sump capacity 100 litres. Colour - Blue. Non returnable. 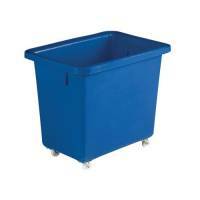 Can Tray Blue 1x25 Litre 312731 Pack of 1 For 25 litre drum storage. Rotational moulded with plastic deck. L550x W550xD110. Can capacity 1x25 litre. 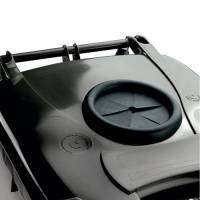 Sump capacity 27.5 litres. Colour - Blue. Non returnable. 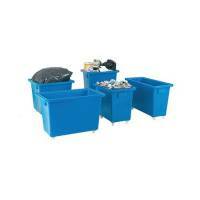 VFM Blue Non-Locking Recycling Wheelie Bin 314633 Pack of 1 Stylish and rugged constructed wheelie bin. Large wheels for extra mobility. W420 x D500mm x H930. Capacity 90 litres. Blue. Non returnable. VFM Red Non-Locking Recycling Wheelie Bin 314633 Pack of 1 Stylish and rugged constructed wheelie bin. Large wheels for extra mobility. W420 x D500mm x H930. Capacity 90 litres. Red. Non returnable. 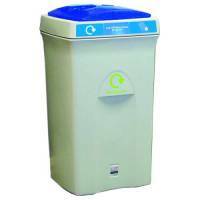 VFM Blue Recycling Paper Envirobin 100 Litre 315270 Pack of 1 Manufactured from high impact polyethylene. Colour coded lid inserts and logos for recycling identification. Paper Only. H803 x W445 x D445mm. Capacity - 100 litres. Non returnable. VFM Grey/Orange Plastic Bottles Recycling Bin 315273 Pack of 1 Manufactured from high impact polyethylene. Colour coded lid inserts and logos for recycling identification. Paper Bottles Only. H803 x W445 x D445mm. Capacity - 100 litres. Non returnable. 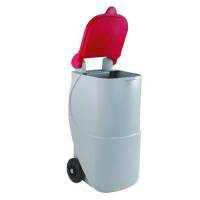 VFM Recycling Cans Envirobin 100 Litre Grey 315275 Pack of 1 Manufactured from high impact polyethylene. Colour coded lid inserts and logos for recycling identification. Cans Only. H803 x W445 x D445mm. Capacity - 100 litres. Non returnable. Paper Recycling Bin Base 132.5L Blue 324161 (Lid not included) Pack of 1 "Rounded corners and smooth contours for easy cleaning. Durable, will not rust, chip or peel. Paper recycling top to fit available separately (see SBY27587). Dimensions of bin H702 x W495 x D495mm. Capacity 132.5 litres. Non returnable." VFM Blue Swivel Castor Bottle Skip 405x610x560mm 328217 Pack of 1 "Medium density polyethylene with smooth, snag free interior. Return lip improves rigidity and aids manoeuvrability. 51mm swivel nylon castors. External L700 x W500 x H620mm. Colour - Blue. Non returnable." 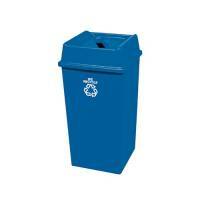 Bottle Skip 580X410X700mm 4X50mm Swivel Blue 328218 Pack of 1 "Medium density polyethylene with smooth, snag free interior. Return lip improves rigidity and aids manoeuvrability. 51mm swivel nylon castors. External L680 x W500 x H770mm. Colour - Blue. Non returnable." Bottle Skip 790X470X550mm 4X50mm Swivel Blue 328225 Pack of 1 "Medium density polyethylene with smooth, snag free interior. Return lip improves rigidity and aids manoeuvrability. 51mm swivel nylon castors. External L890 x W560 x H620mm. Colour - Blue. Non returnable." Bottle Skip 625X570X570mm 4X50mm Swivel Blue 328232 Pack of 1 "Medium density polyethylene with smooth, snag free interior. Return lip improves rigidity and aids manoeuvrability. 51mm swivel nylon castors. External L720 x W665 x H640mm. Colour - Blue. Non returnable." Bottle Skip 930X340X550mm 4X50mm Swivel Blue 328239 Pack of 1 "Medium density polyethylene with smooth, snag free interior. Return lip improves rigidity and aids manoeuvrability. 51mm swivel nylon castors. External L1020 x W430 x H620mm. Colour - Blue. Non returnable." 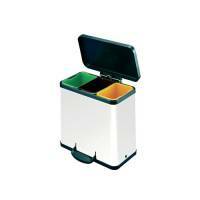 Trento Oko 3X11 Recycling Bin White 357453 Pack of 1 Waste separation systems. Rectangular steel bins with Black plastic lids and pedal mechanism. 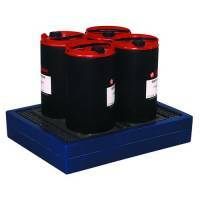 3 x 11 litre bins H440 x W470 x D250mm. Non returnable. Wheelie Bin 120L With Bottle Bank Aperture and Lid Lock Grey 376846 Pack of 1 "Tough and durable bins made from UV stabilised polyethylene. Conform to relevant, RAL, DIN, AFNOR and draft CEN standards. Bottle bank aperture and lid lock. H930 x W480 x D555mm. Capacity: 120L. Colour: Grey. Non returnable." Wheelie Bin 240L With Bottle Bank Aperture and Lid Lock Grey 376848 Pack of 1 "Tough and durable bins made from UV stabilised polyethylene. Conform to relevant, RAL, DIN, AFNOR and draft CEN standards. Bottle bank aperture and lid lock. H1070 x W580 x D740mm. Capacity: 240L. Colour: Grey. Non returnable." Wheelie Bin 360L With Bottle Bank Aperture and Lid Lock Grey 376849 Pack of 1 "Tough and durable bins made from UV stabilised polyethylene. Conform to relevant, RAL, DIN, AFNOR and draft CEN standards. Bottle bank aperture and lid lock. H1070 x W620 x D860mm. Capacity: 360L. Colour: Grey. Non returnable." 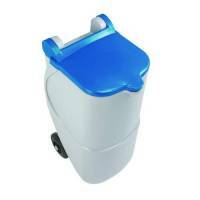 Wheelie Bin 240L With Bottle Bank Aperture and Lid Lock Blue 377866 Pack of 1 "Tough and durable bins made from UV stabilised polyethylene. Conform to relevant, RAL, DIN, AFNOR and draft CEN standards. Bottle bank aperture and lid lock. H1070 x W580 x D740mm. Capacity: 240L. Colour: Blue. Non returnable." 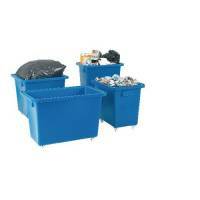 Wheelie Bin 360L With Bottle Bank Aperture and Lid Lock Blue 377867 Pack of 1 "Tough and durable bins made from UV stabilised polyethylene. Conform to relevant, RAL, DIN, AFNOR and draft CEN standards. Bottle bank aperture and lid lock. H1070 x W620 x D860mm. Capacity: 360L. Colour: Blue. Non returnable." Wheelie Bin 240L With Bottle Bank Aperture and Lid Lock Red 377871 Pack of 1 "Tough and durable bins made from UV stabilised polyethylene. Conform to relevant, RAL, DIN, AFNOR and draft CEN standards. Bottle bank aperture and lid lock. H1070 x W580 x D740mm. 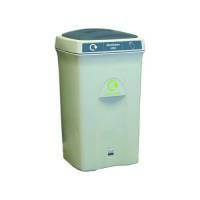 Capacity: 240L. Colour: Red. Non returnable." Wheelie Bin 360L With Bottle Bank Aperture and Lid Lock Red 377872 Pack of 1 "Tough and durable bins made from UV stabilised polyethylene. Conform to relevant, RAL, DIN, AFNOR and draft CEN standards. Bottle bank aperture and lid lock. H1070 x W620 x D860mm. Capacity: 360L. Colour: Red. Non returnable." Wheelie Bin 140L With Bottle Bank Aperture and Lid Lock Green 377875 Pack of 1 "Tough and durable bins made from UV stabilised polyethylene. Conform to relevant, RAL, DIN, AFNOR and draft CEN standards. Bottle bank aperture and lid lock. H1070 x W480 x D555mm. Capacity: 140L. Colour: Green. Non returnable." 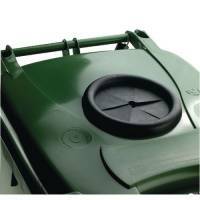 Wheelie Bin 240L With Bottle Bank Aperture and Lid Lock Green 377876 Pack of 1 "Tough and durable bins made from UV stabilised polyethylene. Conform to relevant, RAL, DIN, AFNOR and draft CEN standards. Bottle bank aperture and lid lock. H1070 x W580 x D740mm. Capacity: 240L. Colour: Green. Non returnable." Wheelie Bin 360L With Bottle Bank Aperture and Lid Lock Green 377877 Pack of 1 "Tough and durable bins made from UV stabilised polyethylene. Conform to relevant, RAL, DIN, AFNOR and draft CEN standards. Bottle bank aperture and lid lock. H1070 x W620 x D860mm. Capacity: 360L. Colour: Green. Non returnable."